This article aims to ascertain whether the territorial redistribution observed in the geography of scientific production between 1999 and 2008 translated into a redistribution of the geography of citations, and therefore of scientific visibility. 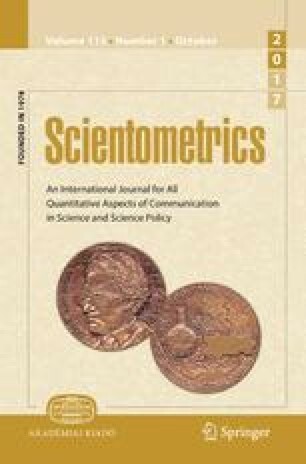 Are publications from formerly marginal locations able to influence researchers based in “central locations”, or is their impact mostly “provincial”? Because the distribution of citations is extremely asymmetrical, it could very well be that the geographic de-concentration of production activities did not lead to the geographic de-concentration of citations, but instead contributed to creating increasingly asymmetrical flows of information for the benefit of “central” cities and countries. This article aims to verify whether this is the case by analysing the geographic distribution of citations received, using a method for localising the publications indexed in the Web of Science by urban areas. Results show a growing convergence between the geography of scientific production and that of scientific citations. The number of citations received by the world’s 30 top publishing countries and cities tended to edge closer to the global average. While Singapore, China, India and Iran suffered from a deficit of visibility in 2000, their level considerably improved by 2007. Moreover, a decrease in the discrepancy between cities’ scientific visibility is observed in almost all countries of the world, except for three: Sweden, Egypt and Denmark. To finish, our results show that the gap between the share of citations and the share of publications has decreased across all disciplines. A significant asymmetry in favour of English-speaking countries has remained in the distribution of citations in humanities and social sciences (but it is diminishing). Musselin, C. (2004). Les projets européens: coopération ou élitisme? Societal, Paris: Institut de l’entreprise. Available from: http://www.institut-entreprise.fr/sites/default/files/article_de_revue/docs/documents_internes/societal-44-28-musselin-dossier.pdf. Accessed 10 Nov 2014.